Recently received this notebook from my daughter and her fiance fro my birthday, and am greatly impressed. Wanted to download/install August 2016 Windows 10 upgrade, but "Settings" search said computer is up to date. Went on Microsoft site and downloaded update, but it will not install. I get a message that the program needs 20gb to install, and only 2gb are free. SSD is only 32gb to begin with. Is there a separate download for notebooks, or will I not be able to install update unless I uninstall programs? When you have a situation like that, you can normally insert a 16 GB usb flash drive for windows to store temporary installation files. Good evening, Mr. Tikkanen, and thanks for your incredibly fast response and simple/easy solution! FYI, the ONLY software I added to this laptop (I still want to use the older "netbook" name) has been McAfee Total Security. The pre-installed software must be HUGE. I'll have to see if there's anything I can safely uninstall. Probably the original W10 operating system and software, plus the recovery partition are eating up most of the 32 GB hard drive. That doesn't leave enough space for the update files to expand and install. Good evening, Mr. Tikkanen. I attached a 32gb flash drive to the laptop and again tried the installation. 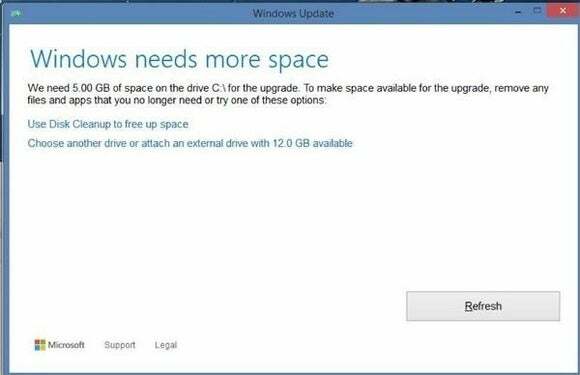 I get a "Windows 10 Update Assistant" window which says "You'll need to free up some disk space on your PC (20GB required). Free up disk space now" If I click on the "Free up disk space now, the Disk Cleanup utility opens and runs, whichaccomplishes nothing. Apparently the flash drive is not being seen. I checked the Dell link you sent me previously, but it does not appear to help, as I do not get an option as to what drive to use. Suggestions? Some things are never easy, are they? According to the Dell link, when you install the 32 GB flash drive, the windows installation routine is supposed to be reporting a "Windows needs more space" prompt, at which you choose another drive, or attach an external hard drive and select the select the drive letter for the USB flash drive to continue with the installation. So maybe you need to get that message first, and then plug in the 32 GB hard drive? Good evening, Mr. Tikkanen. When the installation window opens, the only message I get is the "Windows needs more space" and the prompt to use the Disk Cleanup utility. I don't get the option to choose another drive or attach a flash drive. I have tried attaching the flash drive before activating the Upgrade Assistant; I have tried plugging in the flash drive after activating the Upgrade Assistant and before getting the message, as well as after getting the message. I've also tried transferring the Upgrade Assistant to the flash drive and activating it from there. It has made no difference: I can't get the program to recognize the flash drive in order to install the upgrade. I'm open to any other suggestions and/or assistance. Sorry that nothing is working for you. Unfortunately, I don't have any other suggestions for you to try but perhaps you can call Microsoft and see if one of their techs have any ideas. I appreciate the attempt to help. I do have a Microsoft Store near my home, so I'll see about making an appointment to get some assistance wit this. BE VERY careful when you work with this area!